This apartment is one room divided by two( STUDIO ROOM SLEEPS UP TO 8 PEOPLE) 3 minutes walk from the 3 SUBWAY STATIONS: ROPPONGI, NOGISAKA AND HIRO STATION. FREE WIFI INTERNET TO TAKE WITH YOU WHEREEVER YOU GO. The world renown neighborhood!! You will have the entire apartment to yourselves with everything you need to live like home. 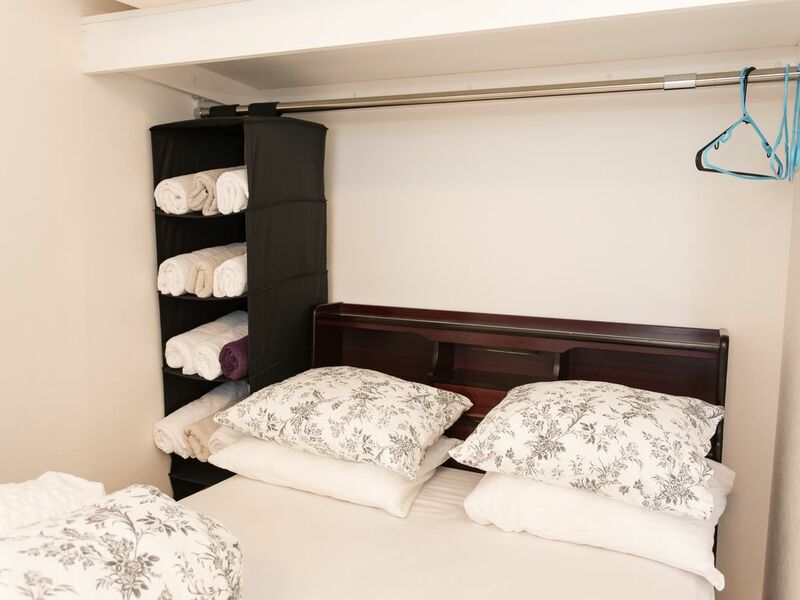 The apartment has 1 big room divided into two - a spacious fully equipped kitchenette, This apartment can accommodate up to 6-7 people comfortably for a short- term stay and it is very child-friendly. The apartment is fully equipped with a washing machine;microwave ;fridge/ freezer;TV;gas stove all no extra cost,With a special treat of Free pocket WiFi which you can carry with you anywhere you go. We provide clean towels,bed sheets,toiletries,laundry supplies for every guest. Roppongi is a famous place for nightlife but also has many important cultural sights. Shinjuju, Shibuya , Ikebukuro , Omote-sando, and Shinagawa are within easy access, just few minutes walk to some stations, 10 mins on a train, or walking 2 to 5 minutes. I always respect my guests' privacy. I don't interfere or disturb their holidays.I just want them to enjoy every moment of their time here in Tokyo. I am always available whenever they need help but do not visit the apartment unless requested to so by guests. It's the trendiest suburb of Tokyo but not only the nightlife gives it a special buzz, it also has top class hotels, restaurants, bars, clubs, movie theaters and world famous museums as well as some parks. Is there convenient public transport? Subway trains run every few minutes. Roppongi itself is very compact and you can walk everywhere within 5 minutes. Are there any other things if note? For architecture buffs, Roppongi has some excellent modern buildings: Roppongi Hills including Mori Tower and its rooftop museum and observatory. The National Art Center with Paul Bocuse restaurant is a beautiful addition to the area. For antique lovers there are several shops specializing in Japanese crafts. Modern Japanese crafts and materials can also be found here. The Tokyo American Club is on the way to the iconic Tokyo Tower. Roppongi itself is very compact and you can walk everywhere within 5 to 7minutes. The apartment was not ehat we paid for. It was NOT the apartment in the pictures, totally a different one. We sent a message to the host and her answer was that there was no mistake, and that was the apartment. The distances to the main places were not the one she says here. The balcony and bathroom had stuff of someone else. Bad experience. Specially because they lied to us with the pictures. The house was not the one we paid for. In the pictures, there was parquet on the floor and a totally different bathroom and kitchen. Instead of being in “Roppongi Lovey Apartment” as written in our reservation, we found ourselves in “Lovely Apartment in Nishi-Azabu”, a totally different one, very small and in certain place very dirty. We found not correct the fact that when we tried to have explanations from the owner, she did not understand the problem and called us liars. Even though the position of the house was great, the apartment was not equipped with enough pots and forks and did not suit for four people. Perfect location, clean, and spacious! Great price and well worth the money! The apartment is a walking distance from the train station (approx. 5-7 minutes), with convenient stores midway. Upon arrival, we had difficulties getting to our apartment due to a sudden downpour. The instructions as to how we should get to the apartment by foot were not very clear, and we were rejected by several taxi drivers (do make sure that the address of the apartment shown to the driver is in Japanese!) This is possibly owing to the fact that we had no internet access available. The apartment was indeed lovely! It looked smaller than what I expected - but still works out fine, cosy at least. It was clean and many amenities were provided. I suppose there are quite a few clubs downstairs, as we could hear loud music, shouting and laughing in the middle of the night (weekend) - thankfully it did not persist! Overall, satisfied with the apartment :-) Did not manage to meet Anne in person, but that's fine too! Would be better if more help could be provided in getting to the apartment for the first time. Thank you!